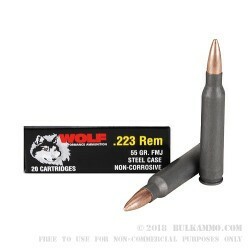 This .223 Remington from Wolf Performance Ammunition hits the sweet spot for non-reloaders, delivering accurate, cost-effective range performance for AR-15s and other .223/5.56 NATO rifles. Each cartridge in this box of 20 fires a 55 grain bimetal jacketed bullet, delivering solid accuracy and reliable ignition. These cartridges are loaded in Russia using non-corrosive Berdan primers and steel cases. The cases are not reloadable but provide dependable feeding and ejection thanks to their polymer coatings. Due to its steel components, this ammo may not be allowed at all indoor ranges. Check before order if unsure.